PRESS RELEASE "On celebration of AUN-QA certificate awarding ceremony for 03 bachelor training programs of HCMUTE"
ASEAN University Network – AUN was first established in 1995 with the purpose of hastening solidarity among university members through training activities, quality assessment and gradual cooperation and recognition of each other's academic fields. At the present, AUN is focusing on qualtity assessment, faculty and student exchange activities, joint training programs among universities. Ho Chi Minh City University of Technology and Education has been an associate member of AUN since March 2014. Accreditation and assessment at program level and institutional level are one of the kernel activities in international integration strategy requested by the Ministry of Education and Training Vietnam and by the internal development of universities. The goals of accreditation and education quality assessment are to help assure and enhance the quality of the training process; to identify how the targets of training programs or institutions in every period are fulfilled; to create a foundation to show governmental and social organizations the true quality status of training programs or institutions; to provide students with information to select their desired universities and help employers in employee selection; to be one of the standards to categorize and rank higher education institutions (according to Article 9 – Higher Education Laws; to be a base to determine education quality, ranking, prestige, self-determination, self-responsibity of an higher education institution; to offer sponsorships, to arrange tasks and to be supervised by government and society (according to Article 53 – Higher Education Laws). AUN has assessed 3 bachelor training programs of Ho Chi Minh City University of Technology and Education (HCMUTE) including Mechatronics Engineering Technology, Electrical & Electronics Engineering Technology and Automotive Engineering Technology from March 15th 2016 to March 17th 2016. The final resutls have shown that all the 3 programs have passed the criteria of AUN-QA with the following scores: Mechatronics Engineering Technology 4.7/7, Electrical & Electronics Engineering Technology 4.8/7 and Automotive Engineering Technology 4.7/7, respectively, whereas score of 4 means "qualified" and score of 5 means "exceeding expectation of AUN". Although this is the very first time HCMUTE applies for AUN quality assessment for up to 3 training programs simultaneously, assessment results show a very similarly high quality and the whole 3 programs have passed well the required score. Indeed, the 3 programs have all gained quite high results in comparison with training programs of other universities in Vietnam which have been assessed by AUN-QA since 2009. On July 25th 2016, HCMUTE was honored to receive Assoc.Prof.Dr. Nantana Gajaseni, Executive Director of AUN to celebrate the AUN-QA quality certificate awarding ceremony for the 3 training programs on our campus. 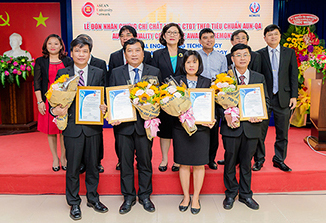 The ceremony started at 2:00pm at Meeting Room No.2, Center Building of HCMUTE, No.1 – Vo Van Ngan Street – Thu Duc District – Ho Chi Minh City. Mechatronics has been a part of our normal life. Mechatronics has been nominated by Technology Review Journal as one of the top 10 prospective technologies to change the world in the 21st century. This is also a chance for developing countries raise up while strengthening their capability in Mechatronics field. Since 2003, Vietnam government has approved the "Vietnam National Science and Technology Development Strategy" in which Mechatronics was emphasized as one of the featured technologies to serve for eco-social development. Ho Chi Minh City also put Mechatronics in the list of top 7 priviledged fields to be invested for further research. This scientific field is gradually becoming a key component of the national economy development. Mechatronics research products are expected to significantly contribute in to development strategy of HCMUTE by 2018 to become a national featured university in scientific training, education and research, an esteemed university getting on a par with other major and famous universities of the nation, approaching and integrating with prestigeous universities in the region and the world. Mechatronics Department belonging to the Faculty of Mechanical Engineering started recruiting students in 2001 and has gone through 15 years of continuous development. In the first semester, only 60 students enrolled but now that number is more than 1,000 with both bachelor and master levels. It is expected that within the 2015 – 2020 period, the Department will recruit 1,500 bachelor students, 250 master students and about 15 PhD candidates pursuing Mechanical Engineering program focusing on Mechatronics. Currently, besides training job, faculty and students of Mechatronics are implementing many programs, research projects at different levels in Mechatronics and Automation. These activities are focusing on finding solutions for practical problems from designing, manufacturing to applying with high efficiency. This reveals a firm foundation of Mechatronics of the univerisity. Perceiving the importance of and capability in Mechatronics, HCMUTE has built up 11 Mechatronics Laboratories and 01 high tech center to facilitate research and training in undergraduate and postgraduate levels, to make Mechatronics one of the strengths of the univeristy when integrating into the international education community. Beside modern facilities, the Department also possesses a strong team of young and potential faculty members willing to support students' research in Mechatronics and Automation. Many research products have been transferred to apply in society. Electrical and Electronics Engineering Technology is one of the most important fields in the national economy. The demand for high quality engineers of this field is always high. The Faculty of Electrical and Electronics Engineering of HCMUTE is also one of the leading faculties of the university who take responsibility to educate high quality engineers from undergraduate to postgraduate level. Electrical and Electronics Engineering Technology is one of the eldest training programs of the Faculty of Electrical and Electronics Engineering that is training students from concepts, design, implementation and operation. Graduates from the program are able to fulfill well job requirements and ready to become global eingineers. They can advise, design, construct, operate not only in power distribution systems, civil systems but also industrial control systems. Furthermore, the students with knowledge and skills gained from practice in top modern level workshops and laboratories (spornsored by big international corps, such as General Electric, Rockwell, Omron, Siemens, and so on) during their studying time in HCMUTE when graduate can even propose research projects for energy saving, operate hi-tech electrical equipment, get involved in organizing and monitoring electrical and electronics projects. In addition, students are equipped with necessary soft-skills to work in teams, communicate and present. English language competency is also emphasized in training students in order for them to be able to exploit international learning materials, technologies or to be self-confident enough to participate in scientific conferences, seminars and technology transfer. The Faculty of Electrical and Electronics Engineering of HCMUTE also frequently organizes company visits and internships for students to big companies, for instant, Phu My Thermo-electricity, Power distribution company, EVN company and others in electrical and electronics field. Thanking to having above-mentioned knowledge and skills, Electrical and Electronics Engineering Technology students are occupying important positions in electrical power companies, industrial factories, electrical construction companies... as well as education organizations in the whole Vietnam. Automotive Engineering Technology is a traditional and key training program of Faculty of Vehicle and Energy Engineering of HCMUTE, which started coincidently with the beginning of the university in 1962. After more than a half of century, the Faculty has provided the labor market of Vietnam with a large number of high quality engineers and technical teachers in Automotive Engineering Technology and contributed significantly to Vietnam Automotive Industry. The Faculty has successfully build up a brandname and taken the leading position in Automotive Engineering Technology among all other universities and colleges in the nation. The Department of Automotive Engineering Technology, like other departments in HCMUTE, is currently applying 150-credit training programs which was constructed with the approach to CDIO. Curricula contents are refined from those of the Automotive Technology program of Southern Illinois University (USA) facilitated by modern teaching methodologies and aim at satisfaction of social demands. The department has great strength in technology-oriented and applied-oriented training programs. Faculty members are holding high level degrees and practical skills (totally 45 members including 03 Associate professors, 12 PhDs, 12 PhD pursuing members and 17 masters). Modern and well-equipped facilities with systems of seminar rooms, laboratories, workshops are available to support the most learning and research of students. Besides, the Faculty frequently receives knowledge (know-how) supports, sponsorships from big automotive companies such as Toyota Vietnam, Mercedes-Benz Vietnam, Ford Vietnam, Isuzu Vietnam, etc. Students are also prepared with knowledge in management, business, service and soft-skills related to the field. As a result, graduated students are always highly evaluated for profession and knowledge, satisfy well requirements of employers and adapt soon with real working condition. Research activity of students is another strength of the Faculty. The students are very active and innovative, usually win prizes in national and international scientific contests, e.g. Vietnam Science and Technology Innovation, Robocon, Eco- and energy saving car (Japan, Philippines), YSEALI, etc. Vietnam economy is developing rapidly, the number of vehicles in use increase very fast, thus automotive industry in Vietnam and ASEAN region has got a big priviledge to expand. Along the formation of the ASEAN common labor market and the participation of Vietnam into Trans - Pacific Partnership Agreement, the automotive industry in Vietnam is kickinf-off a huge number of jobs and demands in Automotive Engineering Technology. With the approval of AUN-QA, the bachelor Automotive Engineering Technology program is the very first automotive training program in the whole Vietnam to achieve this certificate. This achievement strongly proves the efficiency and development of the training program and how well it penetrates into the society. This is also a big advantage of HCMUTE in job application. The Faculty of Vehicle and Renewable Energy Engineering of HCMUTE has been for a long time a reliable arrival for students to pursue the Automotive Engineering Technology field. To enhance even further international integration and quality improvement, HCMUTE has registered for a Civil Engineering Technology program to be the next program assessed by AUN-QA in December 2016. The university has created a plan for quality assessment by 2020 for all other 17 bachelor training programs to be assessed by AUN-QA and 3 bachelor training programs will be accredited by ABET (Accreditation Board for Engineering and Technology), a worldwide recognized USA accreditation organization.